Home / Scrollsaw Patterns / Transportation Scrollsawing Woodworking Projects and Patterns / 1910 Ford Model T Woodworking Pattern. 1910 Ford Model T Woodworking Pattern. 04-FS-179 - 1910 Ford Model T Woodworking Pattern. Henry Ford revolutionized mass production allowing average folks to own an automobile. Base: 17 1/2 inches long x 10 1/2 inches deep. The patterns for our version are full size and include drawings, photos and text instruction to build this classic in wood. Sources for needed material are included. Optional metal wheels can replace those in the plan. If desired, construction features can be added or simplified. Only basic shop tools are needed. Patterns can be easily reproduced on a copy machine to preserve the original pages. With some modification, the project can be increased or decreased in size. Like original Model T Fords, brass-like appointments can be added. The plan includes images of an early license plate, a dash gauge, stop sign arm, a description plaque for the base and a Ford logo for the radiator. The plan is for intermediate to advanced woodworkers. For display use only. Furniture made from this plan is for private use only. Mass producing these plans or the resulting product in any form is prohibited. Registered under the 1976 copyright act, title 17. This paper plan may not be re-labeled, edited in any way to be re-sold and neither may it be digitally converted for electronic transfer. (More on why we are so concerned about copyright.). 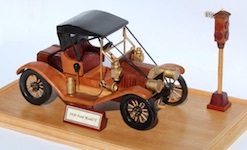 Following three other popular vehicle woodworking plans, we introduce the 1910 Model T Ford plan. It is one of the most recognized vehicles in automotive history. The Tin Lizzy as it was known, was manufactured in the millions early in the 1900s and changed life in America. Stutz Bearcat Antique Automobile Woodworking Plan. The Stutz Bearcat was a favoured status symbol in early automotive history. It began production in 1921 and quickly gained attention with a 360 cubic inch, 4 cylinder L head engine and 60 horsepower. It won significant auto races during this era.